On January 14, 2016 the Disney College Program held a homecoming event for their alumni at the Contemporary Resort in Walt Disney World. The cost was $200 per person, and to sign up you had to be a DCP alum. If you were lucky enough to know someone who was going, they were able to invite one friend (or partner or spouse or whatever) to the event. The event was sold out. 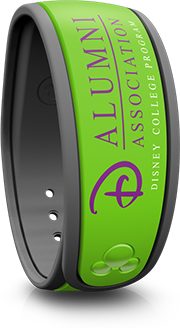 By attending, you were given some free gifts, one of which was a Disney College Program Alumni MagicBand. Initially it was thought that these bands would be labeled as “Limited Edition” (at least that is what the homecoming event signup said), but these didn’t come in a special box and don’t indicate anything special on the back. Most likely these don’t make any lights/sounds at touch points. It’s also surprising that the band isn’t purple with yellow on it, as that is the official colors of the Disney College Program Alumni Association.